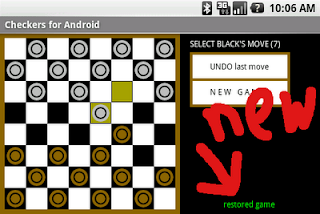 I just posted version 1.5 of Chess, Checkers, and Reversi for Android at the Android Market, all with the much requested "save on exit" feature. If a user exits a game in progress, the game is automatically saved and later restored when the application is restarted. Even if the interrupt happened while the engine was thinking about its move, the game will restart in that state (albeit taking the full allocated time again). Apologies to all users who have been requesting this feature for a while, I just needed to find some time for it. With tears in my eyes I read the news and watched the pictures of the senseless attack on the Dutch royal family by a man who crashed his car through the crowd during the annual Queen's Day celebration. I pray for the victims and those who mourn.